Come and have a stay at our relaxed, unique camp site. We are happy for you to choose your own pitch for tents and small camper vans. Sorry NO motorhomes or large caravans are permitted. 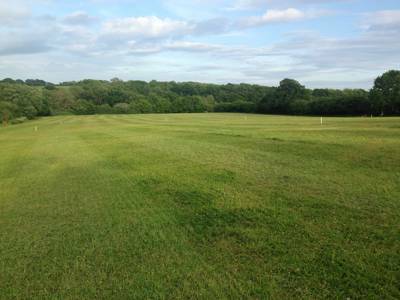 We can offer pitches to horse riders riding the South Downs way. 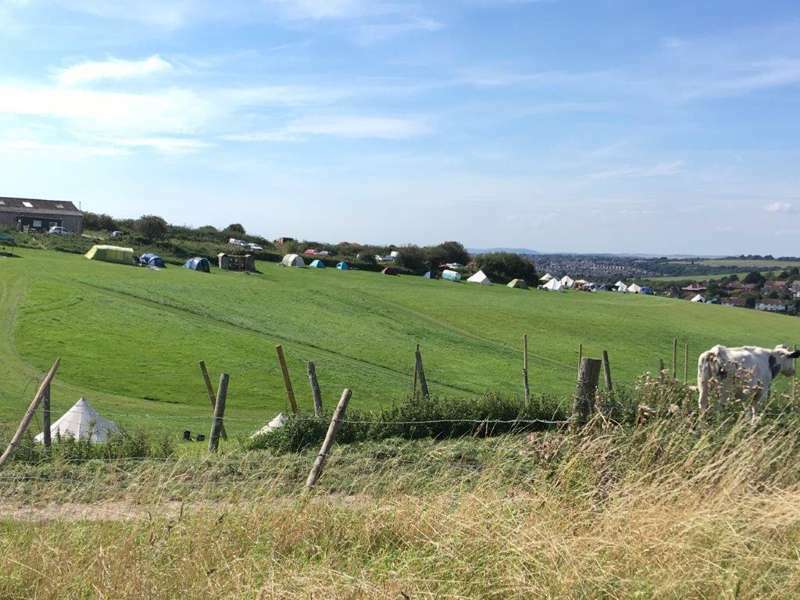 The camp site offers amazing views of Downland and the sea. It is in a perfect location for hiking, cycling or a family break, being only a 10 minute walk from the seafront. We have some great local pubs and many family attractions close by. The Backpacker pitch is for small tents with NO CARs. 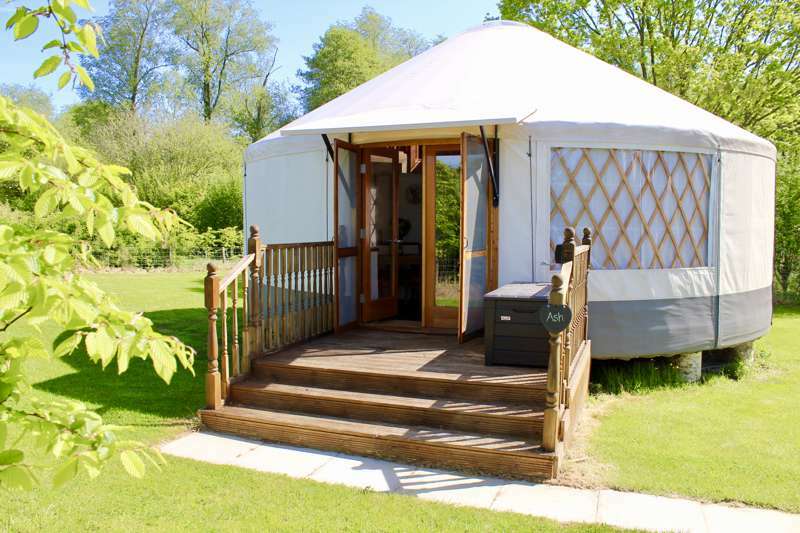 Ideal for hikers, cyclists & horse riders riding the South Downs way. It’s now over a hundred years since Stud Farm in East Sussex had its glory days of a Grand National winner. Shannon Lass, champion of the 1902 race, was trained here on the South Downs, galloping across the green landscape with the dazzlingly blue backdrop of sky and sea. Alas, today the farm has hung up its horse racing shoes in favour of a more laid-back pace to life. There are sheep, pigs, cattle and acres of arable farming space, while horses still clip-clop their way across the livery yard but are here for casual hacking and rides rather than weekend trips to Aintree. 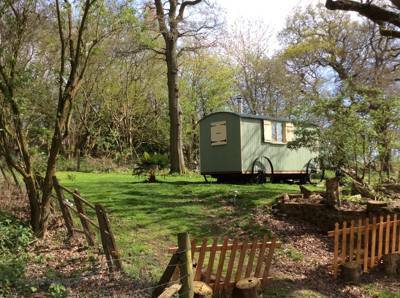 The farm is also home to an excellent little campsite; a perfect place to breathe in the sights and sounds of small-time Sussex agriculture. 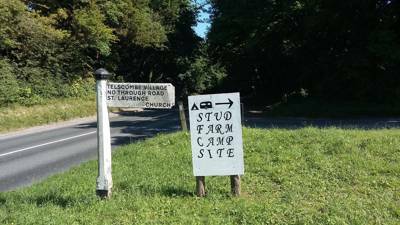 Just a mile and a half from the coast and slap bang on the South Downs Way, Stud Farm Campsite certainly boasts a sought-after setting. Campers in the know should book here early. With just 15 regular pitches and five ‘backpacker’ spots for car-less campers, the campsite has a habit of filling up quickly, especially on summer weekends. The atmosphere is one of back-to-basics simplicity. 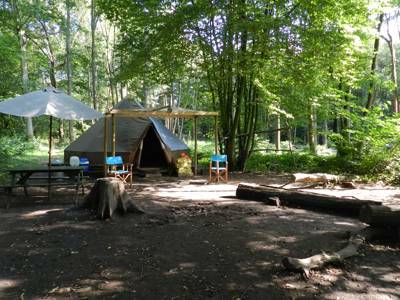 Campfire smoke wafts in the evening breeze, with firepits for hire and logs for sale, while facilities – toilets, taps but no showers – are a thoroughly basic affair. 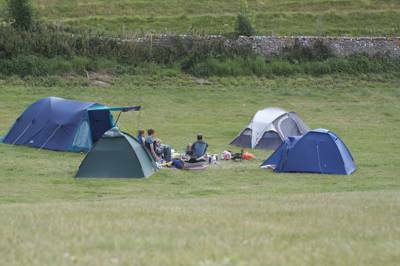 The result is a paired-back campsite with a pleasingly casual atmosphere. Walkers pass through as they pace the full length of the South Downs Way and families come for short breaks, bathing in the English Channel as they forgo their weekend showers. By car, busy Brighton and ancient Lewes are within easy reach. The former is on hand for a vibrant city break by the coast, the latter for stepping back in time and sipping tea in ivy-clad cafés. You needn’t to and fro in the car, however. From the campsite it only takes around 20 minutes to walk to the nearest beach on Telsombe Cliffs waterfront and, when you return, a quick detour via the local pub offers a handy place to refuel. When you get back to Stud Farm, meanwhile, there’s the farm’s own lamb, pork and sausages for your evening supper. Plus, of course, the obligatory evening marshmallows. Bliss. 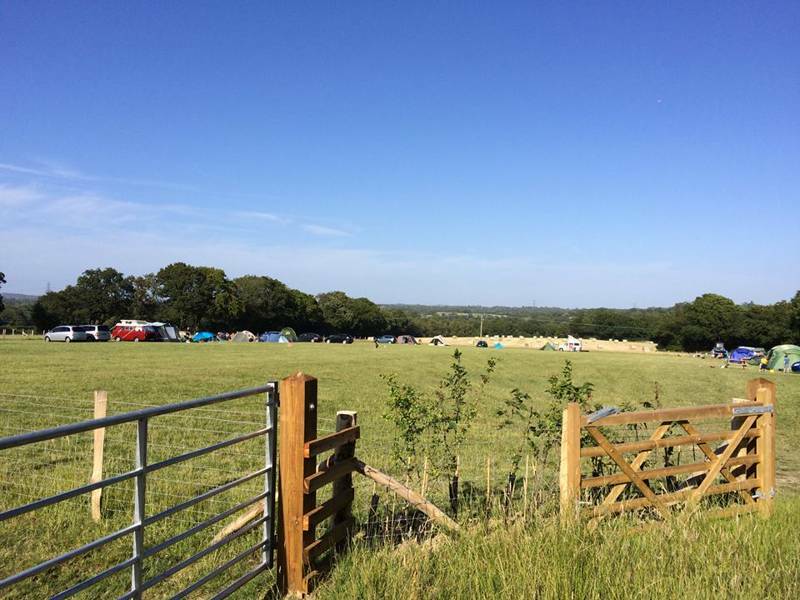 Our picturesque campsite is located on the beautiful South Downs Way, offering pitches for tents and camper vans only, (sorry no large caravans or motor-homes). 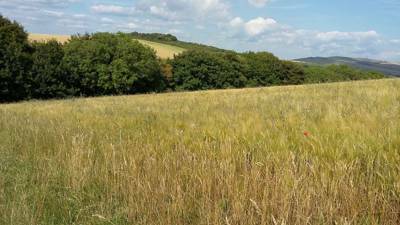 The site is within an Area of Outstanding Natural Beauty with breathtaking views over the Downland and sea. It's also only a 20 minute stroll from the gorgeous Sussex coast and within easy reach of Brighton. The site is purposefully basic and offers a toilet facility, (portaloos) and a drinking water tap also used for washing up. Fire pits can be hired to create a camp fire or barbecue (camp fires directly on the ground are NOT permitted). Logs & fire lighting packs can be purchased along with breakfast & barbecue hampers & marshmallows. 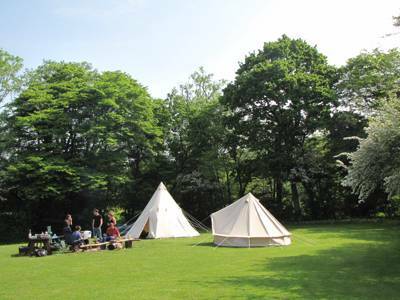 The campsite is dog & family friendly and you are able to park next to your chosen pitch. This is an ideal location for walkers, cyclists and riders, offering them a reduced rate. Stud Farm is a mixed working organic farm. Previously a horse stud and home of a Grand National winner in 1902. It is now a working sheep farm, along with pigs, cattle and arable farming. It also offers horse livery, with a range of stables, paddocks & packages available as well as an outdoor school and homemade hay & straw for sale. We produce our own lamb, pork and a range of sausages & pork burgers, all available for purchase and along with our free-range eggs can be supplied to hungry campers! The beautiful farm house offers B&B with equine companions welcome. Perfect for a ride along the South Downs way. Also look out for our open day running every year on the Sun & Mon of the first May bank holiday. We are based in lovely Telescombe, a historic and picturesque village recorded in the Domesday Book. It is nestled at the foot of the South Downs with Telscombe Tye to the South. It houses the ancient church of St.Laurence which dates back to the twelfth century. Stud Farm forms part of the village along with the village Hall and houses such as The Manor and the Old Rectory. It has less than 50 inhabitants and therefore still remains quiet and unspoilt. For latest availability and best prices for Stud Farm Telscombe Village, please use the Date Search above. 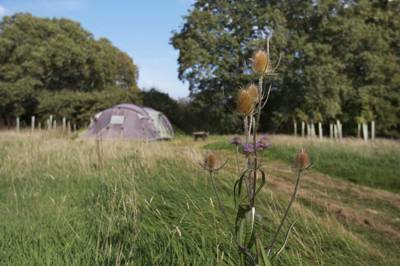 15 regular camping pitches available plus 5 backpacker pitches (space for a 2-person tent but no vehicle). Facilities block includes 4 toilets (2 for men & 2 for ladies) plus 2 showers. Drinking water taps, campfires permitted in firepits (these can be hired for £5 per night). Use your own wood or you can order a fire pack from for £7 (includes logs, kindling & fire lighters). Horse livery available (enquire for further details). The farm also run a B&B. Countryside or city life, the choice is yours. For the former, walk the South Downs Way, drive to the iconic Seven Sisters Country Park or head to Sheffield Park Station (15 miles) to ride through the glorious scenery on the Bluebell Railway Line (01825 720800), while, for the latter Brighton and Lewes are only a couple of miles away and can be reached by local bus. Lewes, a beautiful market town, boasts quaint antique shops, lots of cafés and Harveys Brewery (01273 480 217), for a delicious pint of ale, plus, Lewes Castle and Museum (01273 486290) at the centre of it all. Stud Farm produce their own pure pork sausages and free-range eggs. Along with local bacon, these are sold as a breakfast hamper. Customers can also pre-order bread, milk, butter and beans. Marshmallows with skewers for toasting are also available. There are 3 good local pubs: The Abergavenny Arms (01273 472416) in Rodmell (2 miles), The Telscombe Tavern (01273 584674) in Telscombe Cliffs (8 miles by car but a mere 30 minutes walking direct) and The Smugglers Rest (01273 586593), which is also in Telscombe Cliffs and just as accessible. 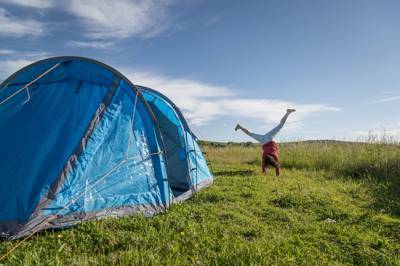 From £12 per night for a backpacker pitch (includes 2 people but no vehicle) and £20 per pitch for a regular pitch (includes 2 people and a vehicle). Extra adults £8 per night; extra children £5 per night. It's 6 miles to Lewes train station (0845 748 4950) and 3 miles to Southease train station (0845 748 4950) – though a very limited number of trains run to the latter. Catch a bus from Lewes to Southease bus stop (20 mins) or the train from Lewes to Southease if it is running.